But no pursuit at Cambridge was followed with nearly so much eagerness or gave me so much pleasure as collecting beetles. It was the mere passion for collecting, for I did not dissect them and rarely compared their external characters with published descriptions, but got them named anyhow. I will give a proof of my zeal: one day, on tearing off some old bark, I saw two rare beetles and seized one in each hand; then I saw a third and new kind, which I could not bear to lose, so that I popped the one which I held in my right hand into my mouth. Alas it ejected some intensely acrid fluid, which burnt my tongue so that I was forced to spit the beetle out, which was lost, as well as the third one. I was very successful in collecting and invented two new methods; I employed a labourer to scrape during the winter, moss off old trees and place [it] in a large bag, and likewise to collect the rubbish at the bottom of the barges in which reeds are brought from the fens, and thus I got some very rare species. No poet ever felt more delight at seeing his first poem published than I did at seeing in Stephen's Illustrations of British Insects the magic words, "captured by C. Darwin, Esq." There are 92 words quoted from Darwin across 31 entries, with a further two entries naming him as the collector but without quotation. 1. DAR 118, list of species. 2. Annotations in Darwin’s copy of Stephens, A systematic catalogue of British insects. 1829 (CUL, MS room). Out of the 281 species with Darwin’s annotations, some remarks are difficult to interpret. On pp. 221-225, there are 17 species with a small x before them (included in the total). On pp. 1-60 there are 36 species with a symbol which looks like 8, which could be a greek gamma. Dates: 7 records with dates, all 1829. Total 422 species in total. Unique species (sometimes genus only) mentioned in these records total 390. 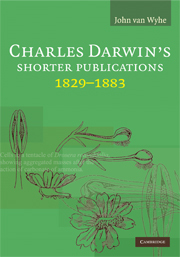 Available below are the title pages of the parts containing citations of Darwin and every page in which a species he collected or his name occurs. The beautiful plates to the volumes are also included. Available in a separate document is the text by Darwin quoted in Stephens: Darwin 1829-1832. The copy scanned was kindly provided by The Balfour and Newton Libraries, Cambridge. Stephens, J. F. 1829-1832. Illustrations of British Entomology, or, a Synopsis of indigenous insects: containing their generic and specific distinctions; with an account of their metamorphoses, times of appearance, localities, food, and economy, as far as practicable. Embellished with coloured figures of the rarer and more interesting species. London: Baldwin and Cradock. Illustrations of British entomology; or, a synopsis of indigenous insects etc. 8vo, 245 mm, 11 vols, 80 coloured plates, Baldwin and Cradock for the author, London [1827-]1828-1835[-1845]; supplement, vi + 32 pp, 15 coloured plates, 1846. The main work is divided into four volumes of Haustellata and seven of Mandibulata. The beetles occur in the first five volumes of the latter, and there are about thirty records bearing Darwin's name, the earliest being in an appendix to Volume II, which is dated June 15, 1829. The localities include Cambridge, North Wales and Shrewsbury. There is one further record which is earlier than this. In Haustellata, Volume II, p. 200, Darwin records the occurrence of the common noctuid moth Graphiphora plecta at 'Cambridge', and the date of this part is June 1, 1829. The modern scientific name of this moth is Ochropleura plecta (L.), and its common name the flame shoulder. In most cases these records are given in quotation marks, and therefore represent genuine publications by Darwin in a book. A manual of British Coleoptera or beetles etc. 8vo, 197 mm, vii + 443 pp, Longman, London 1839. 1 With thanks to J. David Archibald for informing us of this reference.